While it may seem far-fetched that common parasites—including the common Giardia parasite—could be the cause of extreme fatigue and dairrhea, that’s exactly what research has discovered. Giardia is a common intestinal parasite which previously was thought to be responsible for mainly uncomplicated infections characterized by diarrhea. Could a past infection with the Giardia parasite be one of the reasons for extreme fatigue? While it may seem far-fetched that common parasites could be extreme fatigue causes, that’s exactly what new research has discovered. Giardia is a common intestinal parasite which previously was thought to be responsible for mainly uncomplicated infections characterized by diarrhea. These parasites are now considered capable of being extreme fatigue causes. They can lead to chronic fatigue syndrome that may persist as long as five years after the infection, according to Norwegian researchers who published their findings in the medical journal BMC Gastroenterology. Giardiasis is an infection of the small bowel that occurs as a result of ingesting cysts of the Giardia parasite, which is the most common intestinal parasite in the U.S and one that exists around the world. Chronic giardia symptoms usually start within a few weeks after drinking contaminated water, swimming in contaminated water, or consuming food washed in contaminated water or prepared by an infected person. Travel to Eastern Europe (particularly Russia), India, East and West Africa, and parts of the Middle East is associated with giardiasis. Children in day-care centers and people in institutions are common carriers of the Giardia parasite. Campers, backpackers, and people recreating in rivers and streams are all at increased risk. So are people with low stomach acid, such as users of proton pump inhibitors for GERD and acid reflux. Recently, almost 2 percent of samples of ready-to-eat, packaged leafy greens from the U.S., Mexico, and Canada, was found to be contaminated with Giardia. Around 75 to 80 percent of infected people develop parasite symptoms, while the rest remain symptom-free but can still pass on the infection. Acute, profuse, watery diarrhea is the most common complaint of those who do suffer Giardia parasite symptoms. Other parasite symptoms include bloating, abdominal pain, and gas. 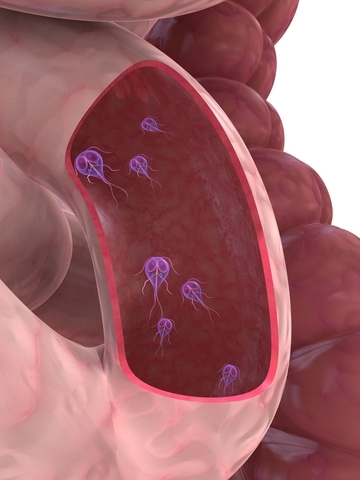 In 20 to 40 percent of cases, giardiasis can lead to short-term lactose intolerance. It may also trigger the onset of irritable bowel syndrome. The infection may be short-lived and go away on its own, in which case no treatment is recommended. If diagnosed (usually with a stool sample), Giardia parasite infection is commonly treated with antimicrobial drugs, such as metronidazole, which are up to 90 percent effective. 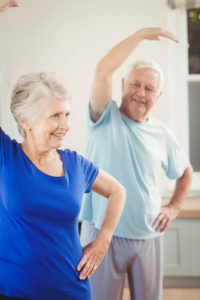 In some people, such as those with compromised immune systems, the infection can be difficult to treat and become chronic. What is the link between these parasites and chronic fatigue syndrome? The Norwegian study mentioned above was the second follow-up study after contaminated water caused a large giardiasis outbreak in a small town in Norway. The first study, conducted three years after the outbreak, showed an elevated risk of both chronic fatigue syndrome and irritable bowel syndrome (IBS). The five-year follow up study did not address IBS, but it did find that the parasites were not only extreme fatigue causes; they also seemed to cause obstructive sleep apnea, depression, and anxiety. Rates of all of these disorders, in addition to chronic fatigue syndrome (and unexplained chronic fatigue not meeting the criteria for chronic fatigue syndrome), were at higher levels than in the healthy population. Chronic fatigue syndrome, however, was the most commonly identified diagnosis in all the patients still suffering fatigue five years after the Giardia parasite exposure. If have a history of being diagnosed with the Giardia parasite and now suffer from chronic fatigue, there could be a link. Working on your gastrointestinal health with integrative and natural therapies is one path toward finally regaining your energy. Of course, Giardia parasite infections are by no means the only extreme fatigue causes. Most researchers agree that chronic fatigue syndrome is the result of multiple causes and triggers. For example, certain viruses can trigger chronic fatigue, as can nutritional deficiencies, such as iron deficiency. Leaky gut syndrome and adrenal gland exhaustion are also chronic fatigue triggers. BMC Gastroenterol. 2013 Feb 12;13(1):28. J Food Prot. 2013 Feb;76(2):307-13. Originally posted in 2013, this post is regularly updated. abdominal pain, acid reflux, antimicrobial, anxiety, apnea, bloating, boosting your energy, bowel syndrome, causes of extreme fatigue, children, chronic fatigue, chronic fatigue syndrome, chronic giardia symptoms, depression, depression and anxiety, diarrhea, extreme fatigue, fatigue causes, fatigue syndrome, food, gastroenterology, gastrointestinal, gastrointestinal health, gerd, gerd and acid reflux, giardia parasite, giardia symptoms, health, ibs, ibs, infection, integrative, iron, iron deficiency, irritable bowel, irritable bowel syndrome, irritable bowel syndrome ibs, lactose intolerance, leaky gut, leaky gut syndrome, low stomach acid, natural therapies, nutritional deficiencies, pain, parasite symptoms, parasites and fatigue, reflux, sleep, sleep apnea, sleep apnea depression, stomach acid, tired, tired of being tired. I was infected with Giardia in 2005 and suffered from chronic fatigue and depression lasting many years. I am interested in learning more about how parasite infection can cause depression. I struggled with depression and had further complications because when treated with antidepressants I in turn became manic. I now believe I have been misdiagnosed as bipolar and am trying to convince my doctor that my depression was rooted in the infection. I recently took rifaximin and have found significant relief from depressive symptoms. I imagine there could be more individuals who are being treated for depression using conventional methods such as ssri that could also benefit from therapies that target intestinal bacteria and parasites. Ellen, it is called the Crazy Cat Woman Syndrome. Had it for years. Treating intestinal parasites is not a 1 treatment, treatment. It takes several doses of medicine to eliminate them from your body. I have taken medicine as directed only to have the parasites return. I found that taking Pyrantel daily for a minimum of 3 weeks and then 1 dose monthly for a year worked. I also took a dose of ivermectin 1 each month. This came from the pet food store in the horse parasite area. Taking a dose based on my weight. Good luck. I have never found anyone in the medical community to help me. The local vet helped more than anyone. I had several visible types of parasites in my stools. Pay attention to the “herx” affect. You will feel worse before you feel better. Last year I developed chronic sponateous urticaria (skin itching) I also had respiratory infections and then got diagnosed with asthma. I am constantly tired and exhausted. I have anxiety and mild depression and everything seems difficult. I did some research myself online and found some information that showed each of my symptoms is related to Giardia. I finally got an appointment at Southampton general allergy clinic this week. The doctor confirmed ‘post Giardia’ apart from antihistamines for the itching and allergies there appears to be nothing I can do about this. The doctor told me it could take up to 5 years to recover. I guess I’m just glad that it is a ‘thing’ and that I’m not going crazy.